Now that we have made the case for low-stress livestock handling (LSLH) as an essential component of operating sustainable and profitable livestock operations, reviewed its requisite foundational elements (i.e., mindset, attitude, reading, working, and preparing animals), and introduced its 12 principles in prior articles, we can get into techniques. So, the purpose of the techniques of LSLH is to put us in the proper position. In other words, they are to help us be where we should be and keep us from being where we shouldn’t be to effectively communicate what we want to our animals which facilitates good outcomes. When we don’t move properly and are not in the correct position we confuse our animals, that’s when they become difficult to work with and we get bad outcomes. Pre-Bud I had no idea, nor did my compadres, that we were literally confusing our animals much of the time by being out of position, and didn’t understand that when we confuse cattle they will start making their own decisions or just want to get away from us. The photographer, the squirrel and the steer all made it to the right place at the right time for this picture. It’s also vitally important to understand that, as Bud says, “Proper position on your part is all the pressure you ever need to move animals, and if you’re in the proper position animals will want to move in the direction you want.” To drive this point home, when Bud used to teach hands-on stockmanship clinics he’d take away all his students “crutches” (horses, dogs, hotshots, prods, paddles) and require them to keep their mouths shut and their hands in their pockets and only use their body position. Now, when doing all the techniques it’s very important to maintain straight lines. According to Bud, when we’re working animals they like us to move in straight lines. Animals respond better to straight lines than curved lines, consequently it is more effective to work them in straight lines. For one thing, curved movements are predatorial and prey animals don’t like it. 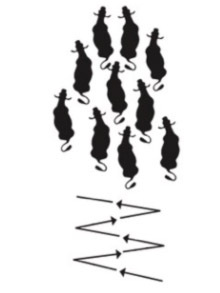 Additionally, our intentions are easy for animals to read when we move in straight lines, which helps keep them in a normal frame of mind, build trust, and clearly communicate what we want. Imagine a car curving towards you at a high rate of speed. How does that make you feel? Now imagine the same car coming at you at the same rate of speed, but it is maintaining a straight line and you can calculate its trajectory and see that it is going to miss you. How does that make you feel? The prior instance is unnerving because you can’t read the driver’s intentions. 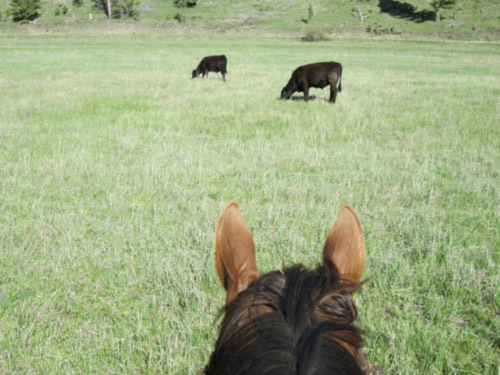 Similarly, when working animals, Bud advises that we “Positively commit to a direction and maintain a straight line; livestock then understand what you want.” Consequently, it’s very important that we always move in straight lines when performing all the techniques. We will first look at driving cattle from the rear because that’s what most people do, and it’s a very effective way to move cattle if done correctly. The problem is that most people don’t know how to do it correctly. What conventional livestock handlers generally do when driving cattle from the rear is to create a lot of pressure via noise, dogs, and pushing from directly behind. Unfortunately, this does not apply effective pressure where animals want to move away and straight. What it generally causes is animals getting in an uncooperative frame of mind where they either want to escape or pushback. 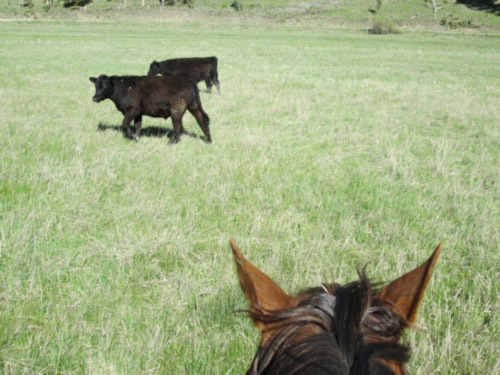 To drive cattle effectively from the rear we need to “zigzag.” Ever watch a good Border Collie drive cattle? What do they do? 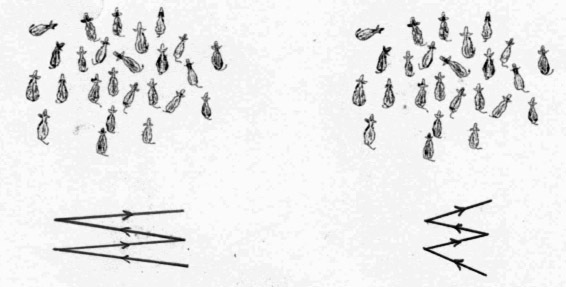 They move in straight lines back and forth behind them, moving closer with each pass as depicted in the following diagram. For the technique to work, our back and forth angle needs to be directed into the animals’ sides at a forward angle as we pass behind, as the following photo sequence illustrates. This creates effective pressure and drives them forward. Consequently, the zigzag is a very effective method of driving animals straight ahead, whether in a corral, an alleyway, or in a pasture. How sharp of an angle do we take and how far across do we go? The answer is the animals’ sensitivity. With more sensitive animals we need to go at a flatter angle which applies less pressure, which allows us to go farther across. With less sensitive animals (e.g., ones that don’t want to go), we have to use a sharper angle which means that we can’t go across as far or else we’ll run into them and cut some off. 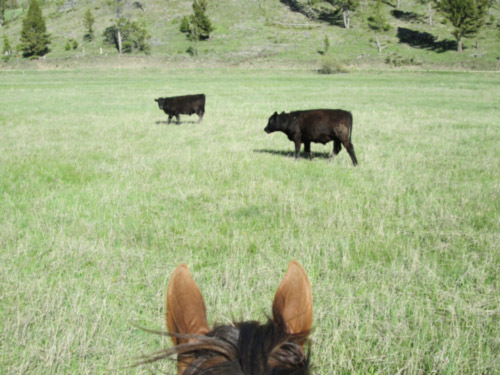 In sum, the most effective way to drive cattle forward from behind them is to use a zigzag pattern that applies effective forward pressure into their sides to which they willingly respond by moving away straight. I generally do the same thing with errant chickens who want to “hang out” after dusk. When I want to herd them back into the pen/coop, I use my arms and body like a rudder. I walk to their left with my left arm extended to make them go right and I walk to their right with my right arm extended to make them go left to herd them. Nice to know I am in good company and that I am doing something that makes sense for other animals too, not just chickens. Thanks for this series of articles. The zig-zag is simple and the cattle basically taught it to me which leads me to believe it is “right”. I am anxiously awaiting the next article in hopes that it will teach me another “right” that I have been too dense to pick up on when trying to work with our cattle. Last weekend I screamed and threw my hat at them a few times. I tripped on an ant pile and fell right behind a chicken tractor. If you know the concept of a chicken tractor you will know what is “behind” one. I laid there and took a few deep breaths and laughed at myself a little. Things could only get better now that I was laying in chicken poop.